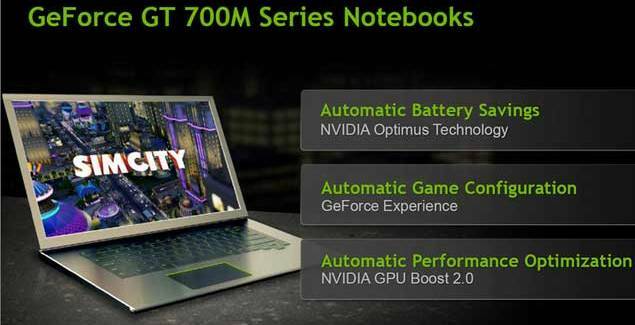 The press service of the company NVIDIA officially announced the release of five new mobile video of the family GeForce GT 700M, of which the GeForce GT 750M, GeForce GT 745M and GeForce GT 740M are designed for use in high-power laptops, GeForce GT 735M and GeForce GT 720M is a solution for the mass market. All solutions support the technology of automatic overclocking GPU Boost 2.0 technology and Optimus, which saves battery power by distributing the load between integrated and discrete GPU. Interestingly, the expression for the performance of new products NVIDIA has invented a new unit of measurement – GeForce Performance Score, equal speed graphics Intel HD Graphics 4000. Traditional characteristics of the manufacturer is not read out, mentioning that they can vary depending on the OEM-manufacturer, they are used. – GeForce Experience (to be more precise, it is a tool) – determines the optimal graphics settings in games, possible on this laptop, and at the same time of Driver GeForce. Now for the technical component. 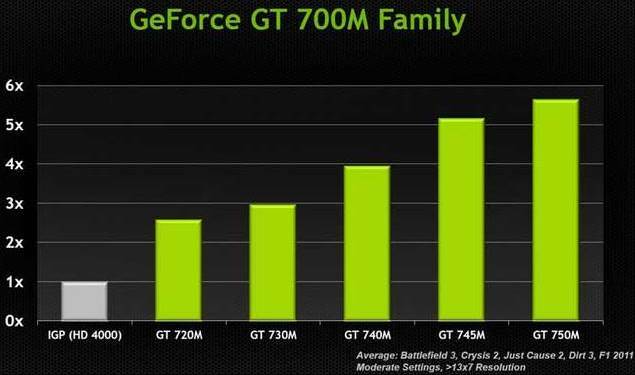 The entire series of NVIDIA GeForce 700M is based on 28-nanometer architecture. Models 750M, 745M, 740M, and 735M-based Kepler boast 384 cores and frequency to 967 MHz, 837 MHz, 980 MHz and 889, respectively (not overclocked). In this case, the first three memory frequency is 2500 MHz, while the latter – 1000 MHz. True, the exact amount of the 128-bit memory (from 735M – 64-bit) is not specified, but it is based on data provided by the company, it can take up to 2 GB (listed as GDDR3, and GDDR5). Against this background, some poor looks the cheapest GeForce GT 720M on the Fermi architecture with 96 cores, frequency of 938 MHz, the “up to 2GB” DDR3 memory at 1000 MHz and 64-bit bus. Are not only compatible with future processors Intel Haswell, and current Ivy Bridge. 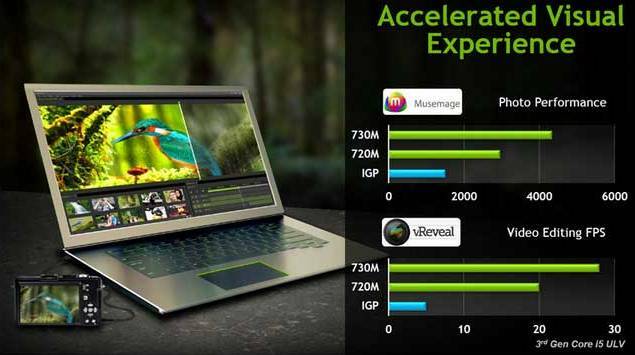 As highlighted in all presented accelerators to increase your laptop’s performance and optimize its energy applied technology NVIDIA GPU Boost 2.0 and NVIDIA Optimus, as well as utility GeForce Experience. It is emphasized that these developments are functioning without any involvement by the user, that is in the background. 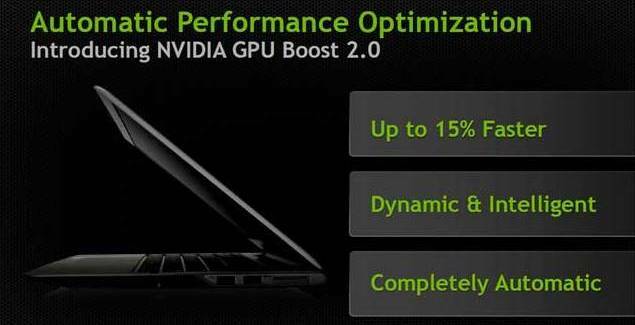 It is reported that the technology NVIDIA GPU Boost 2.0 flexibly adjusts the frequency of GPU for maximum graphics performance, while the NVIDIA Optimus technology increases the battery life, including the GPU only when needed. About the utility GeForce Experience says that it determines the optimal graphics settings in games, as well as updates GeForce drivers automatically. Still it must be said that all video cards support announced bus PCI Express 3.0, compatible with DirectX 11 as well as “friends” with the technology NVIDIA PhysX, NVIDIA CUDA, NVIDIA FXAA and NVIDIA 3D Vision (in the latter case, the exception is the youngest of the new products) . In this case, GeForce GT 750M, GeForce GT 745M and GeForce GT 740M can be equipped with DDR3 memory or GDDR5, while the GeForce GT 735M and GeForce GT 720M equipped with only a memory DDR3. Laptops with data cards in the near future the company will present Acer, ASUSTeK Computer, Dell, Hewlett-Packard, Lenovo, Micro-Star International (MSI), Samsung Electronics, Sony, and Toshiba Corporation.